On Monday morning at 9:00, we began our second session of swimming lessons for the summer. I've been pleased to see how the boys have cheerfully braved the cold mornings (48° and drizzle on the first day) and pushed themselves to do what, just two weeks ago, seemed impossible. Watching them, I can feel butterflies in my own stomach as I remember what it was like to take that first frightening plunge into the deep end, and to make that first nerve-wracking trip down the big slide through blind curves and slippery darkness. We all know what it's like to be pushed in over heads. 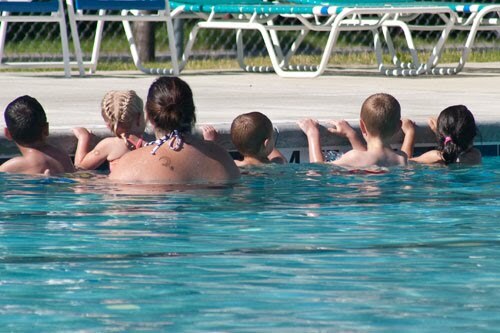 As the instructors carry the Pre-Tadpole students, who cling fiercely to their necks, to the "deep" end of the kiddie pool, one child's panicked shrieks suddenly fly across the bright surface of the water: "Don't let go! Don't let go! It's too deep! I! Caaan't! Swiiiiim!" From our deck chairs we parents watch these frequent displays of childish terror with mild amusement. We know they'll be safe, but they, out there where their feet dangle uselessly above the bottom of the pool, are far from convinced. 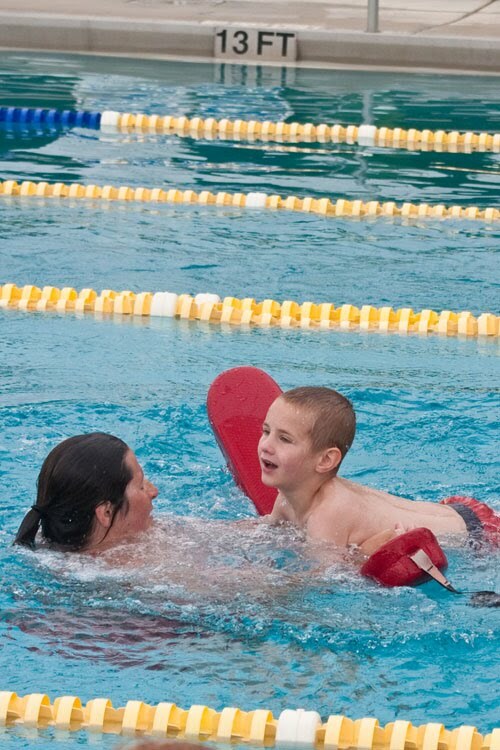 The swim teacher repeats what has become a mantra during the last ten days: "I've got you. You'll be all right. You're not gonna sink." But the wildly kicking legs, the rapid gasps for air and the expression of wide-eyed dread prove that this kid is momentarily deaf to all attempts at persuasion. Until his feet can touch the bottom, he will trust no one and nothing but his gut instincts—which are clearly telling him that he is going to die out here in this 4-foot-deep chlorinated abyss. And while I may chuckle at his frantic behavior, this terrified child is certainly not the only one overcome at times by panic and a sensation of drowning. Water is a blessing that can kill. Is it any wonder that being "in over your head" and being "overwhelmed" are now clichés for that feeling of bewilderment—of being required to do the impossible? These last several months, my husband and I have both felt ourselves drifting away from the shallow end, nearing the deep water where it looks like we're certain to drown. Each time I feel the water rising, I catch my breath and wonder if I can do this. Can we really stay afloat with so much to weigh us down? Can we keep our heads above water while balancing four kids, a marriage, friendships, work, heaps of little projects, church responsibilities, community responsibilities, a pregnancy, a sick grandmother, and a dissertation? Can't we just stay in the shallow end for a while and let the water splash around our ankles? Half the time I feel like flailing and hyperventilating like that kid in the swim class. Well intentioned people may be telling me, "You'll be all right. You're not gonna sink," but all I know is that the bottom is a long way down, and I am anything but buoyant. Keeping our heads above water. That's what we're trying to do this summer. And, as my boys and I can attest, it doesn't always seem possible. When all the evidence appears to point to the contrary, it's hard to believe that we all won't go under. After all, our feet can't touch the bottom. I've heard that youth group leaders and marriage counselors use "trust games" as a method for strengthening relationships between individuals. One person must fall backwards, arms folded, into the waiting arms of another, trusting that those arms will be there to break the fall—strong enough to save and protect from harm. I admit that I've always found the idea of these games pretty ridiculous. I mean, isn't there a less childish and contrived way to build trust? Well, maybe there is. But watching my kids floundering helplessly in water over their heads has given me a new appreciation for these "trust games." 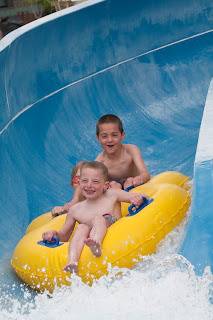 It's easy to laugh at my boys' nervousness—and even at their terror. We know that they have nothing to fear, but they know nothing of the kind. All that stands between them and death is that pair of waiting arms, ready to catch them when they fall, to pull them up when they're sinking. I know exactly how they feel. While I may, like them, be tempted to doubt and to start pleading, "Don't let go! Don't let go!" there are others—many others—who have already been out here before me and survived. Through the years, they've successfully maintained their marriages, finished their projects, raised their families, completed their dissertations. They are expert swimmers, and I'm sure that they are watching me amusedly from their deck chairs as I learn to swim. They are perfectly certain that I am not going to drown. I, while I was back in the shallows of the kiddie pool, found it easy to believe that, too. It's only now, when I'm being called to venture out into these unfamiliar depths, that I grow afraid and begin to sink. I'm not walking on water. I'm not even treading water. I'm with Peter, about to go under and crying, "Lord, save me!" Last week, even with his life jacket firmly secured around his chest and his teacher's arms waiting just below to catch him, Paul was terrified to jump. "Thirteen feet deep. This water is thirteen feet deep," he was thinking. The measurements may have had only vague meaning to his four-year-old mind, but even a four-year-old can see that the water below is a darker, deeper shade of blue than the kiddie pool will allow. All our cheery assurances could not convince him of safe passage through that cobalt expanse, and simply seeing others survive the leap was not proof enough that survival was possible for him. 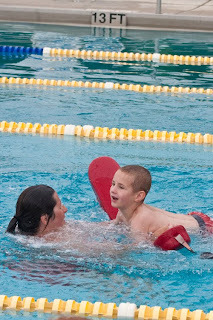 My little Paul could no more save himself from thirteen feet of water than fly, and yet his teacher was calling to him to jump. Shivering with both fear and chill, Paul could not bring himself to step off the end of the diving board. So with a nod from his dad, the instructor dropped him in. And, wonder of wonders, Paul survived. But even his own escape from a watery grave will not convince him to take that fateful step a second time. This, for him, was a true trust game—and not one that, at this point in the season, he was willing to play again. We all know that it's more comfortable back in the shallows. It's easier to believe that we're going to survive when we're sitting on the solid planks of the boat. But if we're called to step away from the edge, to walk out where the blue below us is darker, out where the wind is rising, trust becomes a more difficult matter. We may grow fearful. We may begin to sink. But if we have been called to do the impossible, to jump into the deep end, to step out of the boat in the midst of the sea, go we must.